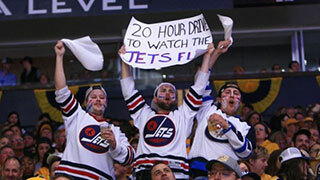 Jets fans can avoid a 20-hour drive. WestJet is making a call to hockey fans across Manitoba to board its jets headed to Las Vegas, Nevada, home of the hockey success story of the year, the Golden Knights. The airline is adding two special nonstop flights between Winnipeg and Las Vegas on 17MAY 20MAY. "WestJet is thrilled to support the Winnipeg hockey community and our WestJetters in their love of Canada's game," said John Weatherill, VP, Pricing and Revenue Management and ‘Chief Winnipeg Hockey Fan.’ "We look forward to flying the spirit of Canadian hockey to Las Vegas and welcoming fans onboard our jets for a convenient nonstop flight." Manitobans wishing to travel outside of these times can also fly nonstop from Winnipeg to Las Vegas, twice weekly this summer on Thursdays and Sundays or up to three times daily through Calgary. Seats are for sale now, and, as WestJet puts it – “additional flights may be determined at the whims of the hockey gods.” So far so good for Canada’s last remaining playoff team after Game 1. Go Jets!